Day 1: Morning departure for our journey to travel to Scarborough, arriving late afternoon at your hotel for 4 nights dinner, bed and breakfast. Day 2: After breakfast the day is free for you to discover the varied attractions of Scarborough. Enjoy the delightful promenade in the attractive Belvedere Gardens, take a short walk across the Spa Footbridge to the centre of town or venture down to the golden beaches of South Bay, or the busy little harbour. Beneath Scarborough’s indoor markets is a warren of antique shops or for the historically minded Scarborough’s fortress castle gives splendid views across two sweeping bays. Day 3: Today we take a ride on the North Yorkshire Moors Railway from Pickering to Goathland. This celebrity station has been seen most recently as Hogsmeade Station on the Harry Potter films and is the home of Aidensfield in the popular TV series ‘Heartbeat’. Enjoy a meander into the local shops or maybe have a swift drink in the ‘Aidensfield Arms’ before continuing our journey across the moors to Whitby. Standing on the River Esk, Whitby is a quaint old fishing town where local fishermen can still be seen mending their nets outside of their cottages in the narrow streets and alleys. Famous as the home of Captain Cook and where the graveyard at the parish church of St Mary, inspired Bram Stoker to include it in his novel ‘Dracula’. Day 4: Enjoy a day excursion to the historic city of York. The whole city has a wonderful atmosphere, and there is so much to see - the intriguing shops in the Shambles, the Jorvik Museum, the Castle Museum with its quaint Victorian streets, the National Railway Museum, and, most stunning of all, York Minster, Europe’s largest gothic church. Day 5: We leave after breakfast and begin our journey home. 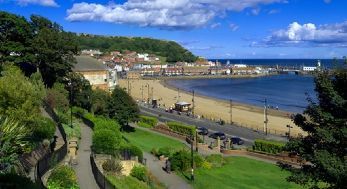 Situated on Scarborough’s picturesque South Cliff, which offers striking views over South Bay. Guests can benefit from the indoor heated swimming pool and free Wi-Fi on offer. There are seven steps to enter the hotel.